Mastering the rules of football might require you to read hundreds of pages. For starters, you only need to understand a few basic rules, to figure out what goes on in the field of play. Here is a summary of essential football rules. Football is played in a rectangular field measuring 100 yards long and 160 yards wide. Along the length, there is a 10-foot long area in each side known as the end zone. In a field of play, each team is expected to field 11 players. Each side has its territory – either half. 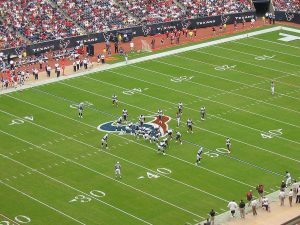 The team with the ball (offensive team) is expected to attack and score points, as the other tries to defend their territory and gain possession of the ball. The object of the team with the ball (offensive team) is to take the ball to the end zone and score points. The attacking team should move the ball a minimum of 10 yards in four attempts, and failure to do this means that they must hand over possession to the defending team. The offense team also has the option of kicking or throwing the ball when they fail to meet the 10-yard threshold. It is worth noting that the lines drawn on the pitch, with yard numbers, are meant to act as a guide for the players. Touchdown – Team scores six points after the ball reaches the opponent’s end zone. Extra Point – Also known as a Point After Touch Down, this an opportunity to score offered to a team after it scores. They can opt to kick, throw, or carry the ball. Field Goal – This goal is awarded when a team kicks the ball past the goal post during their possession. Safety Points – This goal is awarded to the defending team when their defending player successfully tackles the offensive player.